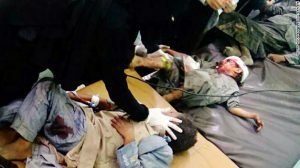 Trump Decries Violence; Will He Denounce Saudi Maiming Children in Yemen? Trump and many other political figures are decrying violence since suspicious packages have been sent to several prominent Democrats and others. Kelly is co-coordinator of Voices for Creative Nonviolence. She has been repeatedly nominated for the Nobel Peace Prize.